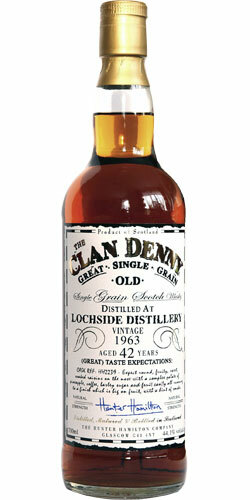 [March, 2017] This is a head-to-head tasting against another 1963 Lochside Grain (JMA) that matured 27 years only https://www.whiskybase.com/whisky/9831/lochside-1963-jm-reserveColour: The Clan Denny (CD) has a dark, almost sherry-like colour compared the a much lighter, but nevertheless full golden colour of the JMA. Nose: While the JMA with its 60,5% abv blockes the nose first the Clan Denny offers a really nice aromas profile that reminds me strongly of an old Bourbon. There is some adhesive flavour besides the oak and vanilla which is quite normal after such a long maturation time. To be able to compare both I dilute the JMA to about the same strength. Now the JMA opens up and offers quite a lot of wild herbs with even a slight medicinical note and honey. A little bit adhesive too, but much lesser than this 42 year old. Clearly the CD is more impressive here. Arrival: Both come bold and instantly coat the mouth. No harsh or unpleasant moment (the JMA is reduced to drinking strength). Very nice both, I go for a draw. Finish: Of medium length with the JMA, virtually endless with the CD. Here the dominant cassis flavour is much more balanced with some nice wooden and spicy notes, making it simply adorable. Yes, the best about the Clan Denny is really the finish. The JMA's finish is interestingly sweet-sour (switching back and forth between the two ) and a little bit drying, but never unpleasant. But this round goes definite to the 42 year old Clan Denny. Using a Glencairn with a glass lid I left this for a bout 30 minutes before I nosed this tonight. Nice nose, but I still think the palate lags behind, even more so than before, my rating has dropped to 85. [January, 2008] Together with friends I emptied a bottle that I bought for 108 Euro in November, 2007. [January, 2014] Together with friends I emptied another bottle that I bought for 138 Euro in August, 2006.In my old rating system (ten scales that translate into WB points: 50 - 66 - 75 - 80 - 82,5 - 85 - 87,5 - 90 - 92,5 - 95) I scored this 90 both times. Please see detailed review below. You can smell the vanilla mixed in with sweet toffee, hint of cinnamon, cinder toffee, a little prune and mixed fruit peels. Good medium length with the bitterness creeping back in towards the end. Nose: Nice old Grain note that really has something of bourbon. The otherwise typical coconut flavor this time almost has a break after the light glue note and vanilligen oak cargo. Mouth: Blackcurrant and quite a lot. slightly tingling mouthfeel. Very fruity and fresh. Finish: sweet, but slightly astringent, fruity and a long finish on oak with the typical Grainnachklang. Conclusion: a good single grain. The great cassis note is a unique selling point. It's very good, but just not the same level as the WIN. Less immediately charming than that of WIN, more grain, with a lot of solvent at the first nose. It opens with a rubbery note, but it is to give way to an almost chocolatey sweetness, before the exoticism finally points the tip of his nose. But an exoticism less exuberant than the WIN, wiser, with blackcurrant and accompanied by notes of caffe latte sweet. Solvents tend to fade with aeration. Woody, but not excessively, it has a nice fruity acidity. The exotic notes are more present than the nose (mango, coconut), but it is the black fruits that burst in strength (blackcurrant, blackberry) in the middle of the mouth. The aromas are still missing a bit of scale, and a dusty sensation, unless it is sawdust, prevents this grain to claim perfection. Medium length, it plays on a fruity / woody well balanced and pleasant.